I have blogged before about creating an ancestor wall in your home. I love the idea of my ancestors having a place of honor where my family, children, and guests can still see them and talk about them. If you want to make this project look a little more vintage, there is a way that you can display your photos that will give them more character and an antique feel. It definitely beats just putting them in matching frames and hanging them on your wall. Do you have some old silver laying around? Is it tarnished, and hardly ever gets used? 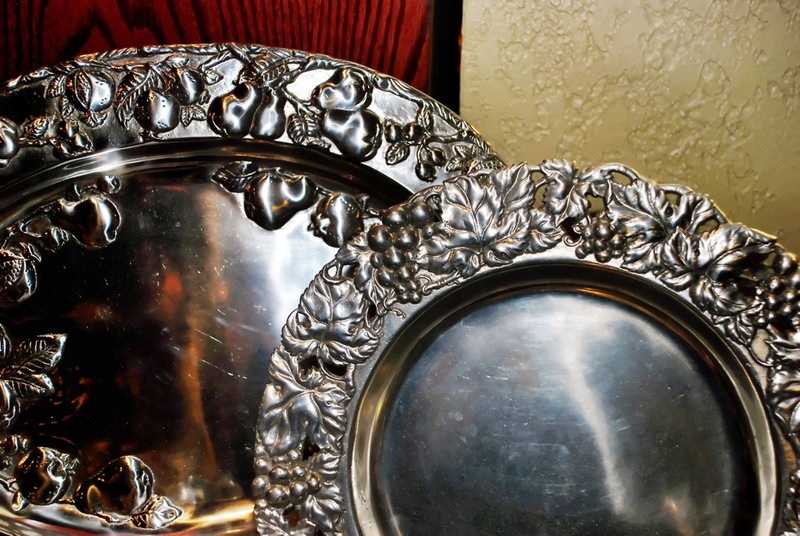 Think about re-purposing some of your silver by using it to display photos. Or perhaps you love to shop at a flea market? You can always find old dishes there that could come in handy for this project as well. The idea is to take old serving dishes, and display photos on them. You can use both ceramic and silver. The key to making this project beautiful is to convert your photos to black and white, or sepia tones. Whichever you decide, make sure that they are all uniform. Never use the original photos. Instead, make copies. The best way to do this would be to take them somewhere where you can re-size them and insure that they will not get damaged. Use various shapes and sizes, and if they are tarnished, don’t polish them! The tarnished look will add to the appeal of the wall. Think of using serving platters with and without handles to add more dimension. You may want to stick with neutral colors when choosing ceramic dishes so that you do not detract from the photo that you are displaying. Measure the dishes and figure out what size photo you will need to fill up the center of the dish, leaving just the decorative edges as the frame. Simply apply the photos to the dish using mod podge like previous projects I have blogged about. You can find one of them here. Plate hooks would be a great way to hang these beautiful dishes on your wall. Our ancestors are a beautiful part of our past, so why not display your ancestors in a beautiful way? Meredith Ethington is the author of this blog. To learn more about Meredith, and her history with Scrapbooking and Genealogy, go here. » When Should You Throw Pictures Away? » Don't Keep it in a Box! » Your Family's "Crown Jewels"
» What's In A Name?